Mrs. Clavano and Mr. Ansaldo visit the school during their walk around Bendum. 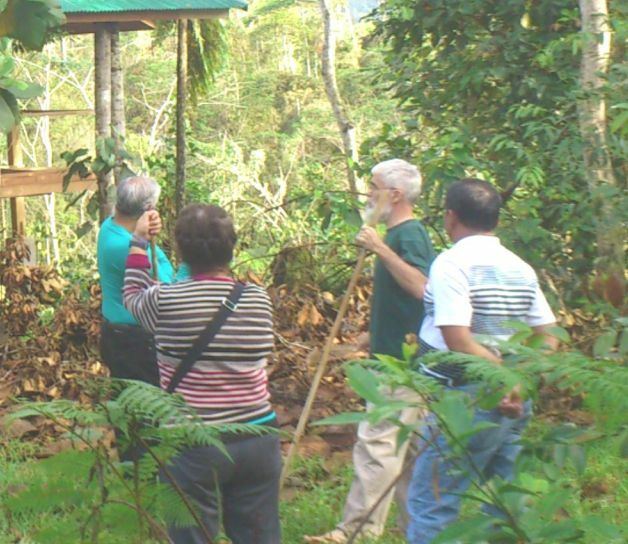 Members of APC’s board of trustees met this month, visiting Bendum in the wake of Typhoon Pablo. Mr. Robert Ansaldo and Mrs. Evelyn Clavano joined Pedro Walpole in discussion about the impact of Typhoon Pablo on the community of Bendum. They also visited the school, met new staff and visited the new infrastructures at APC. Discussions covered new developments in APC’s operations for building management capacity and the Center’s recent visit from the Diocese of Ipil. Board members welcomed the upcoming release of the APC’s monograph on Culture-based Education in cooperation with the Department of Education, which will be published by the Indigenous People’s Education Office (IPsEO), and will be available from the APC website in the following year. Plans were also laid for APC’s upcoming Annual General Meeting (AGM), which will be in the New Year.